WITH a gulp and a deep breath, Jo Shaw shuffled at her papers and looked understandably nervous when she quit the Liberal Democrats live on stage at the party’s conference on Sunday – a protest over the Justice Bill. It’s not often somebody resigns right there. It takes bottle to do that on the main stage. There the delegates were, applauding one of their own members leaving them in front of their eyes. Well done, you’ve quit… clap, clap, clap. 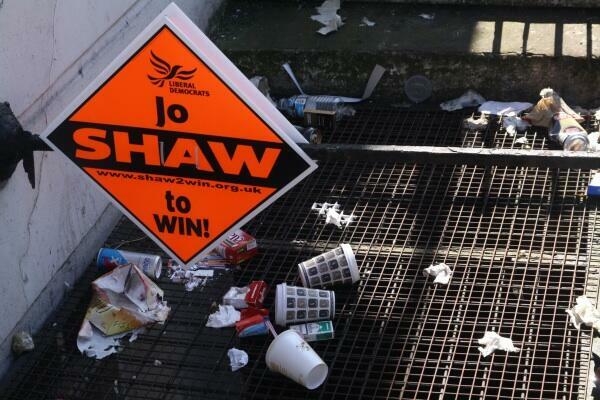 Such a curious scene alone should serve as a warning measure to Nick Clegg about the support from within. It’s worth watching the whole speech through. It might not be delivered with the rump-a-pump of a politician aspiring to be one of the great orators of the television age; it is delivered by somebody who seems genuinely sad. But in a way that kind of makes it appear more effective as a sincere plea for change. It would surely be foolish for the party central office to hold an inquest into how she got onto the stage and not consider what she was saying and why. Somebody from one of the other parties said it was the act of a ‘prima donna’. Maybe. There remains a heap of bitterness over the election material she released three years ago and how it now chimes with party in partnership with the Conservatives. But it’s not really a showy speech or toys out of the pram squeaky, and it’s from the kind of member the party you’d imagine that the party would be desperate to keep hold of. She is somebody who invested the time and energy, even if some of the paths she took as parliamentary candidate in Holborn and St Pancras proved to be blind alleys. It seems she just felt tired of being ignored on an issue that the mattered the most to her. Because this wasn’t a defection and instead a resignation on a principle which many members sympathise with, there remains a lasting fondness among the colleagues she leaves behind. Even those locally who are supportive of Clegg as leader that I’ve spoken to do not seem to have any animosity over it, glossing over whether the speech was a set-piece designed to effectively embarrass the top brass they are trying to protect at an already tricky period for the party. There is a sense of unfinished business and a feeling that maybe one day she will return to the ranks, and that she’d be welcome. There was once an irritation from some members that Jo’s belief that she might actually beat Frank Dobson in the wake of Clegg’s television debates in April 2010 drew resources away from defending certain council seats on the same day, but those frustrations have faded with the wine. She still seems well-liked. There are glowing blogs from what are now her former colleagues. In any respect, local Lib Dems in Camden believe they have been resilient in rocky times, even if only within their own council group, and can hold firm. No councillor has used a council speech to resign over national politics or the deal with the Conservatives. None have defected to Labour, even if there were brief rumours that one might cross the floor 18 months ago. This close-knit group of friends as much as council colleagues, who eat pizza together after Town Hall meetings and marvel at Flick Rea’s port wine jelly, will have to be voted out if they are to leave the council stage. Some have deep-hooks in the community which will take effort for opponents to untangle. Others will certainly be more vulnerable. But one former councillor in Kilburn remains enthused enough to be ready to throw their hat into the ring for the still unresolved Hampstead and Kilburn parliamentary selection contest. They insist they can change the party from within. That’s a bit of bright spin after a week which Jo described as “sad” for the Lib Dems. Labour members clearly smell blood around our neighbourhoods regardless of how resignations and dissatisfaction are explained away. The moment of truth might just be next year’s council elections. Having been a fellow school Governor with Jo for a number of years I commend her strength of resolve to resign from the Liberal Democrats as I had done back in 2009. The reasons Jo gave in her address and clearly from the heart and her strong beliefs. She certainly made mainstream news media for the motion. Yes it may be a sad week for the Liberal Democrats to be seen to lose even there core beliefs such as civil liberties which was a principle reason when I was a Liberal Democrat and then a Conservative. Yes I do not think that this is actually a party polarisation topic. As Jo said this began under New Labour with the Blair Government and has been continued again in the Coalition Government. Perhaps in hindsight, apart from highlighting the motion of appeal by a “Tour de force” resignation Jo may have served her cause better by making this speech with the spectre of resignation. But as I have said no one can know better that than Jo herself. Once again. Congratulations Jo on such a brave stand, well done. Saw fellow Islington councillor Greg Foxsmith looking very glum the other day. He had probably just realized how many empty seats there will be at the next Lib Dem Lawyers’ meeting.